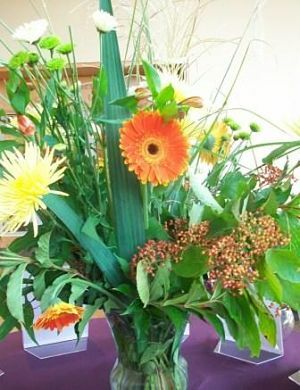 This group opted to forgo a florist and made their own centerpieces. Can we say GORGEOUS!? How many times have we heard that adage that you must spend money to make money? SuccessfulMeetings.com posted an article last week, “Business Travel Study: Companies That Spend More, Make More.” The study was funded by the National Business Travel Association and found that for every $1 spent on business travel, over $15 could be earned. The report examined ten years of data, and cautioned that under-spending on travel during a recession could cause companies to lose out on profit. “Find some other area with less impressive ROI to eliminate,” the metrics seem to suggest. Groups planning an auction fundraiser should consider this line of thinking. Recognize that cutting some areas of your auction budget will have a more harmful effect than cutting others. But if there is some risk riding on your auction … either financially, or in the way you present it, or because of who is attending that night … I wouldn’t eliminate the one professional who has experience in engaging a crowd and getting them to spend money! If a budget reduction is in order, reduce expenses in areas that have hard-to-prove ROI. Redesign the benefit auction catalog to get more for less. Use a DJ instead of a band. One group eliminated the entertainment entirely, mentioning (after this organization and I worked together for a year) that the live auction was entertaining enough without the added cost of entertainment. Would you miss any of these elements? It depends on the format of your event, but it’s not likely.